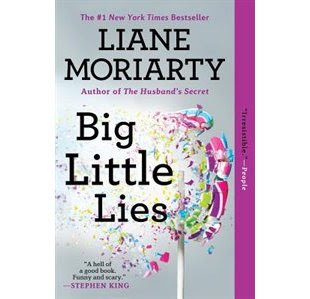 This month's book club selection was Big Little Lies by Liane Moriarty. This was the first book I had read by this author and I didn't know what to expect. It was introduced as a murder mystery, which is fine, but I don't typically read books like that. Although the murder is introduced right away but not revealed until the end, I still wouldn't think of it as your typical murder mystery. It was a light and easy read that happened to have some outstanding questions that keep you guessing throughout. The story takes place in Australia and centers around the parents of a new kindergarten class. This was very timely for a few of us in book club as some of our kids were in JK this year and others will be entering JK next year. Aside from the underlying death and wondering who would be killed and how, it was a very interesting commentary on how parents relate to each other now. There were some obvious exaggerations in the story for the sake of emphasis and plot, but it is very true that when you get a group of parents together, there will be judgments and comments. I am guilty of it too, although I do actively try to avoid speaking out loud with judgment. I haven't had a lot of experience with other parents since I didn't do daily pick up and drop off at the official start and end of the school day. Rather Dave and I shared this, and E attended the before and after school program so we didn't see the same parents all of the time. The day after I finished the book, I did go to school slightly suspicious of the other parents - I wondered if there was this whole other world that I was missing. I could only imagine what they were saying about me, the working mother who doesn't volunteer in the classroom and whose husband seems to be doing a lot of the work!! The horror!! But then I figured out that first of all, it doesn't matter what other people think, and second of all, I don't think the stay at home moms really gather around at 9:00 am and talk about all of the other parents...or maybe they do and I'll find out all about it next year when I am on mat leave and I become one of "them". But I digress, the book was very entertaining and well written. I would recommend it. The characters were all well developed and I could really get a sense of their personalities. I liked picking up on little clues throughout and thought I was so smart when I figured out a few things on my own. I'd like to check out her other books too. It sounds good to me as I prefer murder mysteries. I got a chuckle out of your comments re: possible 9 am gathering of the moms.